Although attention deficit and hyperactivity disorder is one of the most studied disorders in medical literature, its etiology has not been completely elucidated. Clarification of the factors associated with attention deficit and hyperactivity disorder is of significance for the curative treatment of the disorder. While literature states that iron deficiency may present a risk factor for the pathophysiology of attention deficit and hyperactivity disorder, the studies made on this subject so far have provided contradictory results. 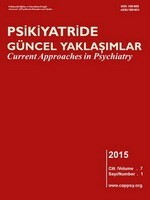 This article aims to analyze the studies of children and adolescents in literature made in Turkey and abroad on the levels of iron and iron-related parameters in blood, which are considered to be effective in the pathophysiology of attention deficit and hyperactivity disorder, compile the general characteristics of those studies and present the results. Dikkat eksikliği ve hiperaktivite bozukluğu, tıp literatüründe en iyi araştırılmış bozukluklardan biri olmasına rağmen, etiyolojisi halen net olarak açıklığa kavuşturulamamıştır. Dikkat eksikliği ve hiperaktivite bozukluğu’nun küratif şekilde tedavi edilmesi için bozukluk ile ilişkili etmenlerin net olarak aydınlatılması oldukça önemlidir. Literatür incelendiğinde, demir eksikliğinin dikkat eksikliği ve hiperaktivite bozukluğu patofizyolojisi için bir risk faktörü olabileceği belirtilmekle birlikte, konu ile ilgili şu ana kadar yapılan çalışmalarda çelişkili sonuçlar elde edildiği gözlenmektedir. Bu yazıda, dikkat eksikliği ve hiperaktivite bozukluğu patofizyolojisinde etkili olduğu düşünülen demir ve demirle ilişkili parametrelerin kan düzeyleri ile ilgili literatürdeki, çocuk ve ergen yaş grubunda, ülkemizde ve yurt dışında yapılmış konu ile ilgili çalışmaların incelenmesi, genel özelliklerinin derlenmesi ve sonuçlarının sunulması amaçlanmıştır. Ağaoğlu L (2010) Demir eksikliği anemisi. In Anemiler, Cilt 2 (Eds O Neyzi, TY Ertuğrul):1051-1054. İstanbul, Nobel Yayıncılık. APA (American Psychiatric Association) (2000) Diagnostic and Statistical Manual of Mental Disorders, 4th ed., Text revision (DSM- IV-TR). Washington, DC, American Psychiatric Association. Andrews NC (1999) Disorders of iron metabolism. N Engl J Med, 341:1986-1995. Atamna H, Walter PB, Ames BN (2002) The role of heme and iron-sulfur clusters in mitochondrial biogenesis, maintenance, and decay with age. Arch Biochem Biophys, 397:345-353. Barkley RA, Fischer M, Smallish L, Fletcher K (2004) Young adult follow-up of hyperactive children: antisocial activities and drug use. J Child Psychol Psychiatry, 45:195-211. Beard JL, Connor JR, Jones BC (1993) Iron in the brain. Nutr Rev, 51:157-170. Beard J (2003) Iron deficiency alters brain development and functioning. J Nutr, 133(Suppl 1):S1468-S1472. Beard JL, Connor JR (2003) Iron status and neural functioning. Annu Rev Nutr, 23:41-58. Behrman R (2004) Diseases of the blood. In Nelson Textbook of Pediatrics, 14th ed. (eds R Kliegman, W Nelson, V Vaughan):1614-1616. Philadelphia, W.B.Saunders Com. Berrak SG, Türkan E, Canbolat C, Kahveci S (2010) Çocuklarda demir eksikliğinin tedavisi düşük gelişim test skorlarına etkisi. İstanbul Tıp Fakültesi Mecmuası, 65:1-7. Biederman J, Faraone SV (2005) Attention-deficit hyperactivity disorder. Lancet, 366: 237-248. Black MM (2003) Micronutrient deficiencies and cognitive functioning. J Nutr, 133(Suppl 2):S3927-S3931. Brittenham GM (2000) Disorders of iron metabolism: Iron deficiency and overload. In Hematology: Basic Principles and Practice, 3rd ed. (Eds R Hoffman, EJ Benz, SJ Shattil, B Furie, HJ Cohen, LE Silberstein et al):397–428. New York, Churchill Livingstone. Bülbül SH (2004) Çocuk beslenmesinde demirin yeri ve önemi. Sürekli Tıp Eğitimi Dergisi, 13:446-450. Calarge C, Farmer C, DiSilvestro R, Arnold LE (2010) Serum ferritin and amphetamine response in youth with attention- deficit/hyperactivity disorder. J Child Adolesc Psychopharmacol, 20:495-502. Castellanos FX (1997) Toward a pathophysiology of attention-deficit/hyperactivity disorder. Clin Pediatr (Phila), 36:381-393. Connor JR, Menzies SL (1996) Relationship of iron to oligodendrocytes and myelination. Glia,17:83-93. Cortese S, Lecendreux M, Bernardina BD, Mouren MC, Sbarbati A, Konofal E (2008) Attention-deficit/hyperactivity disorder, Tourette’s syndrome, and restless legs syndrome: The iron hypothesis. Medical Hypotheses, 70:1128-1132. Cortese S, Konofal E, Bernardina BD, Mouren MC, Lecendreux M (2009) Sleep disturbances and serum ferritin levels in children with attention-deficit/hyperactivity disorder. Eur Child Adolesc Psychiatry, 18:393-399. Cortese S, Angriman M, Lecendreux M, Konofal E (2012)a Iron and attention deficit/hyperactivity disorder: What is the empirical evidence so far? A systematic review of the literature. Expert Rev Neurother, 12:1227-1240. Cortese S, Azoulay R, Castellanos FX, Chalard F, Lecendreux M, Chechin D et al (2012)b Brain iron levels in attention- deficit/hyperactivity disorder: a pilot MRI study. World J Biol Psychiatry, 13:223-231. D'Amato TJ (2005) Is iron deficiency causative of attention-deficit/hyperactivity disorder? Arch Pediatr Adolesc Med, 159:788. Donfrancesco R, Parisi P, Vanacore N, Martines F, Sargentini V, Cortese S (2013) Iron and ADHD: time to move beyond serum ferritin levels. J Atten Disord, 17:347-357. Ekici Ö (2012) Demir eksikliği ve demir eksikliği anemisinin tiroid hormonları üzerine etkisi (Uzmanlık tezi). Kırıkkale, Kırıkkale Üniversitesi. Ercan ES (2010) Dikkat eksikliği hiperaktivite bozukluğunda epidemiyolojik veriler. Türkiye Klinikleri Pediatrik Bilimler Dergisi, 6(2):1-5. Erikson KM, Jones BC, Hess EJ, Zhang Q, Beard JL (2001) Iron deficiency decreases dopamine D1 and D2 receptors in rat brain. Pharmacol Biochem Behav, 69:409-418. Faraone SV, Sergeant J, Gillberg C, Biederman J (2003) The worldwide prevalence of ADHD: is it an American condition? World Psychiatry, 2:104-113. Faraone SV, Biederman J, Mick E (2006) The age-dependent decline of attention deficit hyperactivity disorder: a meta-analysis of follow-up studies. Psychol Med, 36:159-165. Faraone SV, Biederman J, Morley CP, Spencer TJ (2008) Effect of stimulants on height and weight: a review of the literature. J Am Acad Child Adolesc Psychiatry, 47:994-1009. Georgieff MK (2011) Long-term brain and behavioral consequences of early iron deficiency. Nutr Rev, 69(Suppl 1):S43-S48. Grindulis H, Scott PH, Belton NR, Wharton BA (1986) Combined deficiency of iron and vitamin D in Asian toddlers. Arch Dis Child, 61:843-848. Harpin VA (2005) The effect of ADHD on the life of an individual, their family, and community from preschool to adult life. Arch Dis Child, 90(Suppl 1):S2-S7. Hill JM, Switzer RC 3rd (1984) The regional distribution and cellular localization of iron in the rat brain. Neuroscience, 11:595-603. Juneja M, Jain R, Singh V, Mallika V (2010) Iron deficiency in Indian children with attention deficit hyperactivity disorder. Indian Pediatr, 47:955–958. Karakurt MN, Karabekiroğlu MK, Akbaş S, Bilgici B, Kılıç, M, Şenses A et al (2011) Association between symptom profiles and iron and ferritine serum levels in children with attention deficit hyperactivity disorder. Nöropsikiyatri Arşivi, 48:125-128. Kayıran SM, Gürakan B (2010) Çocuklarda demir eksikliğinin motor gelişim ve bilişsel fonksiyonlar üzerine etkisi. TAF Preventive Medicine Bulletin, 9:529-534. Kessler RC, Adler L, Barkley R, Biederman J, Conners CK, Demler O et al (2006) The prevalence and correlates of adult ADHD in the United States: results from the National Comorbidity Survey Replication. Am J Psychiatry, 163:716-723. Kırmızıtaş A, Kılınç Y (2005) Demir eksikliği anemisi olan çocuklarda çözünebilir transferrin reseptörü, eritrosit çinko düzeyi ve serum çinko düzeyinin tanıdaki yeri (Uzmanlık tezi). Adana, Çukurova Üniversitesi. Kiddie JY, Weiss MD, Kitts DD, Levy-Milne R, Wasdell MB (2010) Nutritional status of children with attention deficit hyperactivity disorder: a pilot study. Int J Pediatr, 2010:767318. Konofal E, Lecendreux M, Arnulf I, Mouren MC (2004) Iron deficiency in children with attention deficit hyperactivity disorder. Arch Pediatr Adolesc Med, 158:1113–1115. Konofal E, Cortese S, Marchand M, Mouren MC, Arnulf I, Lecendreux M (2007) Impact of restless legs syndrome and iron deficiency on attention-deficit/hyperactivity disorder in children. Sleep Med, 8:711-715. Kwon HJ, Lim MH, Ha M, Kim EJ, Yoo SJ, Kim JW et al (2011). Transferrin in korean children with attention deficit hyperactivity disorder. Psychiatry Investig, 8:366-371. Lahat E, Heyman E, Livne A, Goldman M, Berkovitch M, Zachor D (2011) Iron deficiency in children with attention deficit hyperactivity disorder. Isr Med Assoc J, 13:530-533. Le HH, Hodgkins P, Postma MJ, Kahle J, Sikirica V, Setyawan J et al (2014) Economic impact of childhood/adolescent ADHD in a European setting: the Netherlands as a reference case. Eur Child Adolesc Psychiatry, 23:587-598. Lozoff B, Brittenham GM, Viteri FE, Wolf AW, Urrutia JJ (1982) The effects of short-term oral iron therapy on developmental deficits in iron-deficient anemic infants. J Pediatr, 100:351-357. Lozoff B, Brittenham GM, Wolf AW, McClish DK, Kuhnert PM, Jimenez E et al (1987) Iron deficiency anemia and iron therapy effects on infant developmental test performance. Pediatrics, 79:981-995. Lozoff B (1988) Behavioral alterations in iron deficiency. Adv Pediatr, 35:331-359. Lozoff B, Jimenez E, Smith JB (2006a) Double burden of iron deficiency in infancy and low socioeconomic status: a longitudinal analysis of cognitive test scores to age 19 years. Arch Pediatr Adolesc Med, 160:1108-1113. Lozoff B, Beard J, Connor J, Barbara F, Georgieff M, Schallert T (2006b) Long-lasting neural and behavioral effects of iron deficiency in infancy. Nutr Rev, 64(Suppl 2):S34-S43. Mahmoud MM, El-Mazary AA, Maher RM, Saber MM (2011) Zinc, ferritin, magnesium and copper in a group of Egyptian children with attention deficit hyperactivity disorder. Ital J Pediatr, 37:60. Mannuzza S, Klein, RG (1999). Adolescent and adult outcomes in attention deficit/hyperactivity disorder. In: Handbook of Disruptive Behavior Disorder, (Eds HC Quay, AE. Hogan):279–294. New York, Kluwer Academic/Plenum Publishers. Menegassi M, Mello ED, Guimarães LR, Matte BC, Driemeier F, Pedroso GL et al (2010) Food intake and serum levels of iron in children and adolescents with attention-deficit/hyperactivity disorder. Rev Bras Psiquiatr, 32:132-138. Millichap JG, Yee MM, Davidson SI (2006) Serum ferritin in children with attention-deficit hyperactivity disorder. Pediatr Neurol, 34:200–203. Murray-Kolb LE (2013) Iron and brain functions. Curr Opin Clin Nutr Metab Care, 16:703-707. Nigg JT, Tannock R, Rohde LA (2010) What is to be the fate of ADHD subtypes? an introduction to the special section on research on the ADHD subtypes and implications for the DSM-V. J Clin Child Adolesc Psychol, 39:723-725. Oğrağ H, Bağ Ö, Kutlu A, Öztürk A (2012) Dikkat eksikliği hiperaktivite bozukluğu olan çocuklarda demir eksikliğinin rolü. İzmir Dr. Behçet Uz Çocuk Hastanesi Dergisi, 2:127-130. Oner P, Oner O (2008) Relationship of ferritin to symptom ratings children with attention deficit hyperactivity disorder: effect of comorbidity. Child Psychiatry Hum Dev, 39:323-330. Oner O, Alkar OY, Oner P (2008) Relation of ferritin levels with symptom ratings and cognitive performance in children with attention deficit-hyperactivity disorder. Pediatr Int, 50: 40-44. Oner O, Oner P, Bozkurt OH, Odabas E, Keser N, Karadag H (2010) Effects of zinc and ferritin levels on parent and teacher reported symptom scores in attention deficit hyperactivity disorder. Child Psychiatry Hum Dev, 41:441-447. Oner P, Oner O, Azik FM, Cop E, Munir KM (2012) Ferritin and hyperactivity ratings in attention deficit hyperactivity disorder. Pediatr Int, 54:688-692. Ortiz E, Pasquini JM, Thompson K, Felt B, Butkus G, Beard J et al (2004) Effect of manipulation of iron storage, transport, or availability on myelin composition and brain iron content in three different animal models. J Neurosci Res, 77:681-689. Oski FA, Honig AS (1978) The effects of therapy on the developmental scores of iron-deficient infants. J Pediatr, 92:21-25. Oski FA (1993) Iron deficiency in infancy and childhood. N Engl J Med, 329:190-193. Pelham WE, Foster EM, Robb JA (2007) The economic impact of attention-deficit/hyperactivity disorder in children and adolescents. J Pediatr Psychol, 32:711-727. Polanczyk G, Jensen P (2008) Epidemiologic considerations in attention deficit hyperactivity disorder: a review and update. Child Adolesc Psychiatr Clin N Am, 17:245-260. Roncagliolo M, Garrido M, Walter T, Peirano P, Lozoff B (1998) Evidence of altered central nervous system development in infants with iron deficiency anemia at 6 mo: delayed maturation of auditory brainstem responses. Am J Clin Nutr, 68:683-690. Swanson JM, Kinsbourne M, Nigg J, Lanphear B, Stefanatos GA, Volkow N et al (2007) Etiologic subtypes of attention- deficit/hyperactivity disorder: brain imaging, molecular genetic and environmental factors and the dopamine hypothesis. Neuropsychol Rev, 17:39-59. Tamir H, Klein A, Rapport MM (1976) Serotonin binding protein:enhancement of binding by Fe2+ and inhibition of binding by drugs. J Neurochem, 26:871-878. Thapar A, Cooper M, Jefferies R, Stergiakouli E (2012) What causes attention deficit hyperactivity disorder? Arch Dis Child, 97:260- 265. Thapar A, Cooper M, Eyre O, Langley K (2013) What have we learnt about the causes of ADHD? J Child Psychol Psychiatry, 54:3-16. Tunç B (2008) Çocuklarda demir eksikliği anemisi. Türkiye Çocuk Hastalıkları Dergisi, 2:43-57. Uyan Z, Peker AGC, Tekiner AS, Ulukol B (2014) Ergenlerde dikkat eksikliği hiperaktivite bozukluğu sıklığının araştırılması. Konuralp Tıp Dergisi, 6(3):21-26. Ünal S, Yetkin S (2004) Demir eksikliği anemisi. Katkı Pediatri Dergisi, 16:327-345. Walter T, Kovalskys J, Stekel A (1983) Effect of mild iron deficiency on infant mental development scores. J Pediatr, 102:519-522. Walter T, De Andraca I, Chadud P, Perales CG (1989) Iron deficiency anemia: adverse effects on infant psychomotor development. Pediatrics, 84:7-17. Wigglesworth JM, Baum H (1988) Iron dependent enzymes in the brain. In Brain Iron: Neurochemical and Behavioral Aspects (Ed MB Youdim): 25-66. New York, Taylor and Francis. Willcutt EG, Nigg JT, Pennington BF, Solanto MV, Rohde LA, Tannock R et al (2012) Validity of DSM-IV attention deficit/hyperactivity disorder symptom dimensions and subtypes. J Abnorm Psychol, 121:991-1010. Wolraich M (1999) Attention deficit hyperactivity disorder: the most studied and yet most controversial diagnosis. Ment Ret Dev Disab Rev, 5:163–168. Wolraich ML, McGuinn L, Doffing M (2007) Treatment of attention deficit hyperactivity disorder in children and adolescents: safety considerations. Drug Saf, 30:17-26.
WHO (World Health Organization) (1992) The Prevalence of Anemia in Women: A Tabulation of Available Information, 2nd ed. Maternal Health and Safe Motherhood Programme. Geneva, Switzerland, World Health Organization. Worwood M (1990) Ferritin. Blood Rev, 4:259-269. Yehuda S (1990) Neurochemical basis of behavioral effects of brain iron deficiency in animals. In: Brain, Behavior and Iron in the Infant Diet (Ed J Dobbing):83–106. London, Springer-Verlag. Yip R (2002) Prevention and control of iron deficiency: policy and strategy issues. J Nutr, 132(Suppl 4):S 802-S805. Youdim MBH (1985) Brain iron metabolism: Biochemical and behavioural aspects in relation to dopaminergic neurotransmission. In Handbook of Neurochemistry (Ed A Lajath):731-755. New York, Plenum Press. Youdim MB, Ben-Shachar D, Yehuda S (1989) Putative biological mechanisms of the effect of iron deficiency on brain biochemistry and behavior. Am J Clin Nutr, 50(Suppl 3):S607-S615. Youdim MB (2000) Nutrient deprivation and brain function: iron. Nutrition, 16:504-508. Zimmermann M, Adou P, Torresani T, Zeder C, Hurrell R (2000) Iron supplementation in goitrous, iron-deficient children improves their response to oral iodized oil. Eur J Endocrinol, 142:217-223.